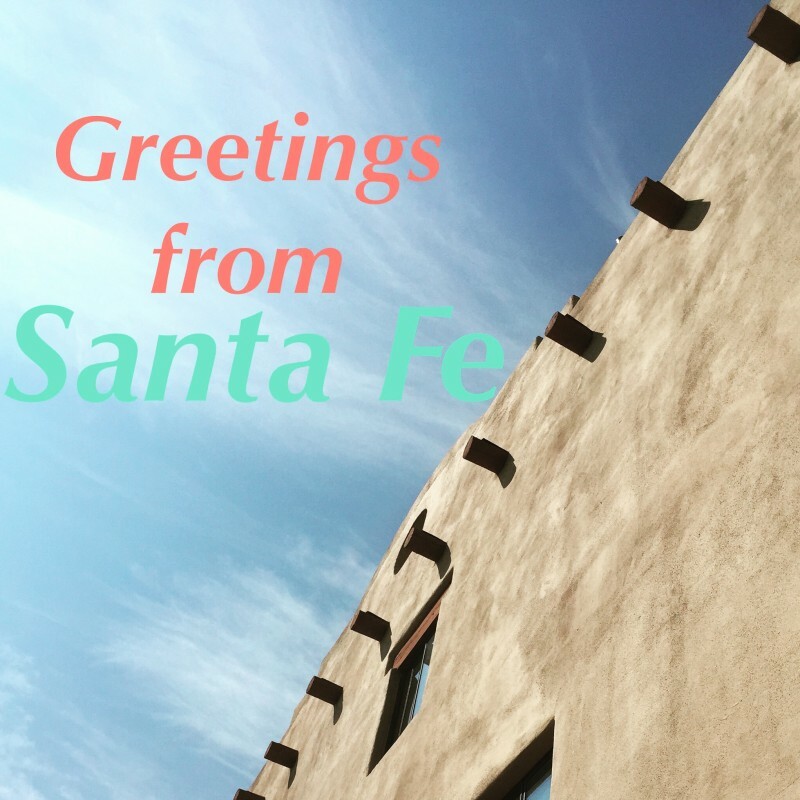 The intimate, bustling neighborhoods that surround the Santa Fe Plaza, simmer with the spices and flavors that not only make up the Southwestern palate, but are steeped in the essence that proudly calls itself New Mexican cuisine. Welcome to Santa Fe, New Mexico, where everyone is family. Already into our second full city stop on our “Kitchens of the Southwest Tour,” we expected impatient tourists, but were greeted with warm, friendly smiles at almost every turn. But before I get into the meat and bones of my enchanted culinary tale, let us begin, as they say, at the beginning. 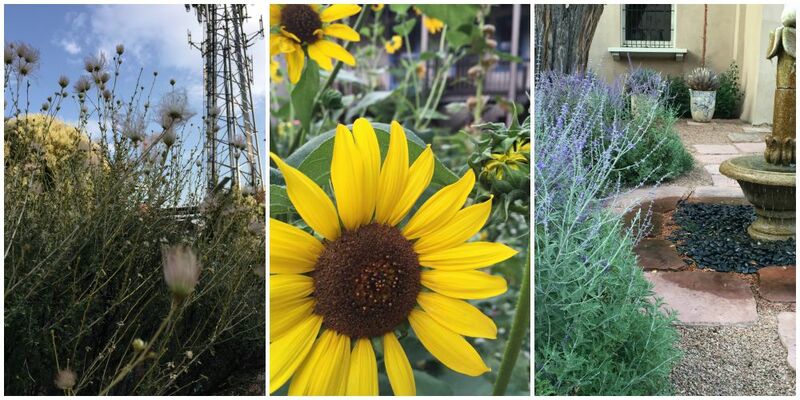 We lingered a bit longer in Sedona, AZ, and as a result we ended up checking into our hotel room at the Best Western Plus Inn of Santa Fe a little later than expected. Driving north on interstate 25, we caught a glimpse of another spectacular desert sunset, our first in New Mexico. A canvas exploded before our very eyes, in a burst of purples, pinks and oranges, crowned by dazzling blues. Checking in we were a little disappointed to be “far” from “the sites” of touristy Old Town Santa Fe. But upon waking we realized that in a small town, nothing is really “far” away. 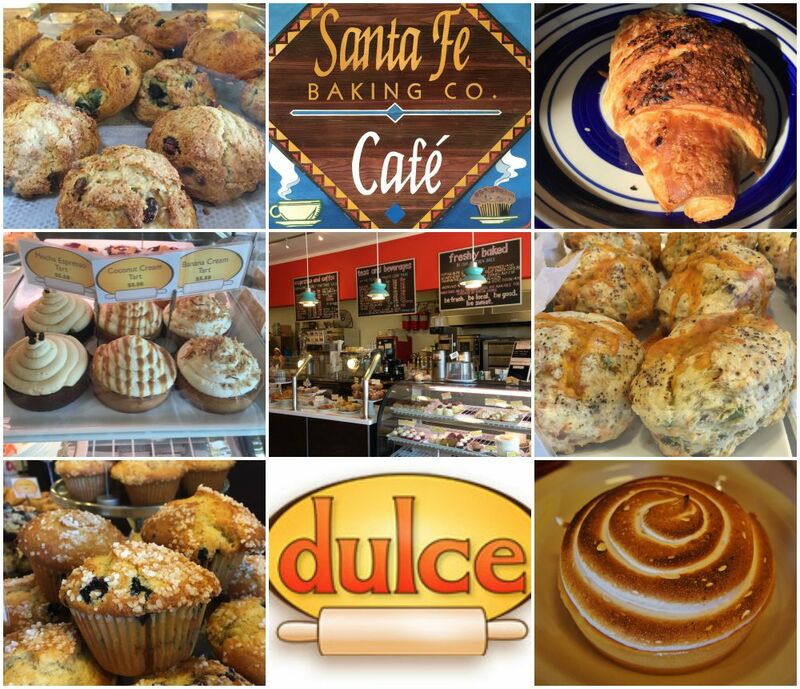 In a few short minutes, we drove to our first stop to have breakfast at Santa Fe Baking Co. and Café. This place is abuzz with locals who crowd the patio and drink their coffee and eat a bowl of green chile while reading the newspaper, yup, actual paper. The pastry case is loaded with rustic looking sweet and savory treats and the menu is filled with standard diner food like omelets, scrambles, French toast, burgers, sandwiches, and wraps. And from what we sampled, they range from “okay” to “pretty tasty,” but big whoop, right? Well, we were drawn to this place because it’s where the locals meet up and eat, and they led us to the green chile, a staple throughout New Mexico, and done really well here. Intense flavors give way to spice, and while you might sweat a little, it’s nothing you can’t handle. If you’re in the mood for something more mobile, get the breakfast burrito (scrambled eggs, potatoes, cheese) with your choice of green chile, red chile…or both. They are so simple, but the chile keeps ‘em coming back for more. They also have a carne adovada burrito, stuffed with seasoned pork, cooked in red chile with egg, potatoes and cheese, smothered in even more red chile. The smothering makes it less mobile, but I won’t judge you. If you need a grab-n-go meal, get the croissant that is stuffed with turkey and green chile. These things can be simple or they can be intensely flavorful, and with Sante Fe Baking Co. and Café we lucked out. For our afternoon snack, we headed to Dulce, a hip and trendy café with loud colors and bold paintings of giant cupcakes and slabs of pie. The café was smaller and a lot more crowded as a result. But we waited patiently on yellow plastic chairs for our drinks and pastries. The green chile scones had the perfect crumble for a scone and still smelled of freshly baked flour, which I am a sucker for. We had some time to kill before lunch, so we walked around Santa Fe Plaza, with a smattering of tourists browsing the boutiques for southwestern art, pottery, jewelry, etc. 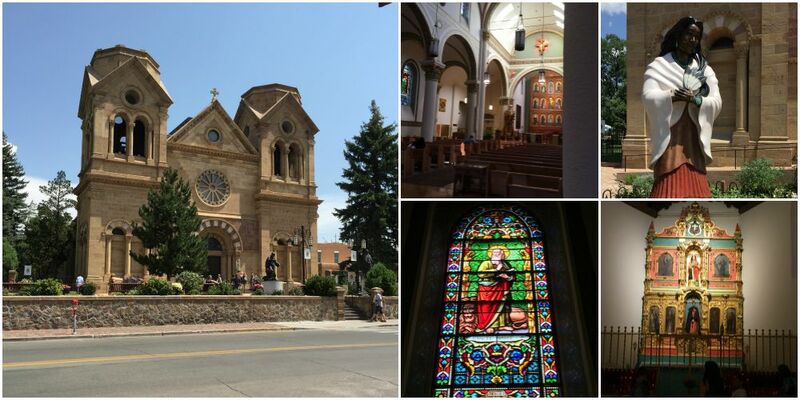 The Cathedral Basilica of Saint Francis of Assisi, while a touristy draw, is a tranquil space for prayer, worship and peaceful contemplation, so no flash photography please! A statue of Saint Francis is in front of the cathedral, but so is a more colorful statue of Saint Kateri Tekakwitha, the first North American Indian to be beatified, and later canonized. Once you’re past the heavy bronze doors, you’ll be dazzled by stained-glass and a huge centrally located baptism font. Don’t forget to light a candle and say a little prayer before you venture off. Back outside, we caught sight of a fajita cart in the plaza, but didn’t want to ruin our appetite for lunch and instead we strolled the galleries and found a secret garden or two. We even tried the museum but found it was closed in preparation for the Santa Fe Indian Market, held annually over two days on the weekend after the third Thursday in August. It’s a market where Native Americans from various tribes across the country can gather to sell their art directly to the public. There are very strict standards and guidelines for the artists, and they can enter into various contests. The market was first held in 1922, and has since grown into a citywide event that draws over 100,000 people from all over the world. We were a few days early, but if you find yourself in Santa Fe on this weekend, you are in for a treat…just come early. 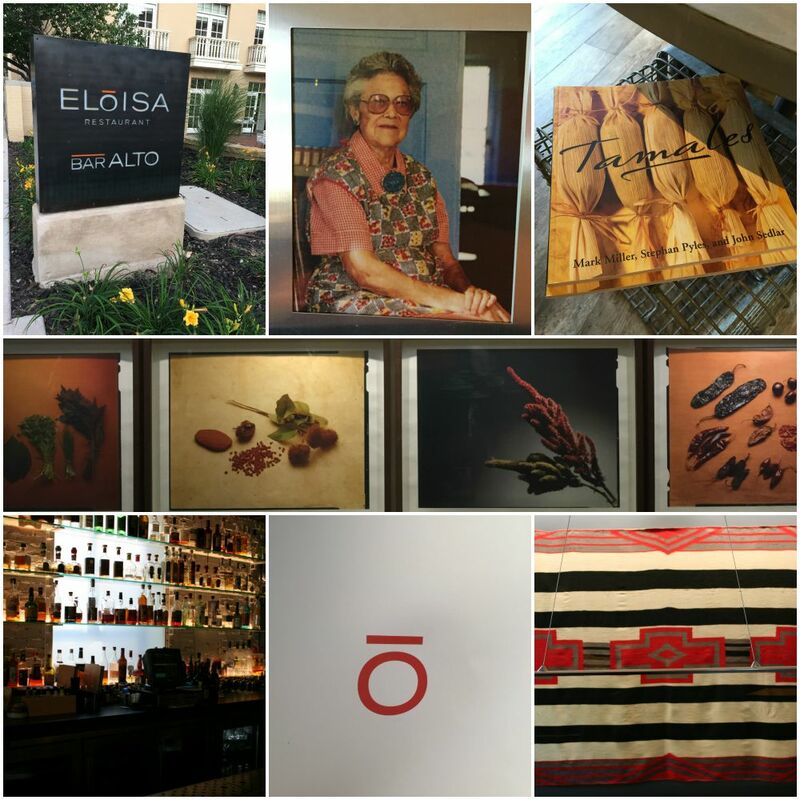 And then it was finally time for lunch at one of Santa Fe’s newer restaurants, Eloisa. The restaurant occupies a large part of the first floor of the Drury Plaza Hotel, just behind the cathedral. Eloisa has a small marketplace you enter through, which has a collection of preserves, pickled items and sauces, not to mention a collection of cookbooks written by Chef John Rivera Sedlar, yes, THAT Rivera. After closing shop in Los Angles, Chef Sedlar has returned home to Santa Fe, and back to his roots of southwest cuisine. Many Angelinos lament the loss of his restaurants, Rivera and Playa, but his food lives on in New Mexico. Eloisa has a (mostly) different menu than the famous Rivera, but there are a few items that Chef Sedlar brought with him, like the Duck Enfrijolada (duck confit, blue corn tortillas, radicchio, crema, New Mexico cabernet chile sauce) that I couldn’t resist and his signature Tortilla Florales (house made nixtamal tortillas with “Indian butter”). While his braised kurobuta pork short ribs have been transformed into a Carne Adobaba dish (sous-vide kurobuta pork chop, chimayo chiles, frijoles blancos). Stephen’s carne adobada (adovada?) was paired with another Rivera icon, soft maize budino served with black quinoa and red amaranth, in his signature corn husk bowl. It was like seeing an old friend…a delicious one. In addition to the tortillas florales, we ordered some braised cabbage because Stephen is addicted (also from Rivera) and the Ensalada Sandia (compressed watermelon, tomato, cucumber and shrimp with a surprising mojito vinaigrette). Of course, while we have big appetites, we couldn’t eat much more…until dessert was brought out. Call us gluttons if you want, you wouldn’t be wrong at this point, but refusing one of Chef Sedlars desserts is heretical, and we were Cathedral adjacent. So after a few deep breaths, we dove into the Crema Catalan Café, a delicate coffee flavored pudding with candied orange peel, and the exquisite (I still dream of this dessert) brioche French toast with popcorn ice cream, a gentle crumble and slivers of peaches. I was reminded that simple food made well with great care and skill, can turn out to be things of magnificent splendor. 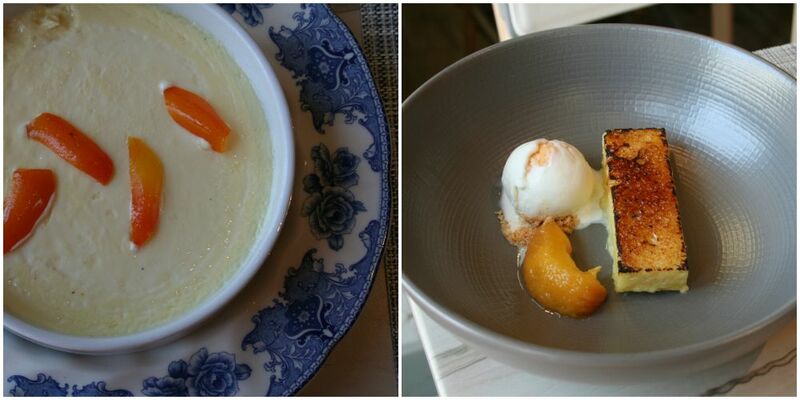 If your sweet tooth is feeling nostalgic, Chef Sedlar is still making his poblano chile & lime sorbet. And then it was over. Lunch at Eloisa is going to cost a bit more than your usual green chile joint, but oh it sure is worth it. It’s the perfect place for a working lunch at the big communial table, a date night, a solo lunch on the patio or drinks on the rooftop bar, also run by Chef Sedlar, called Bar Alta. 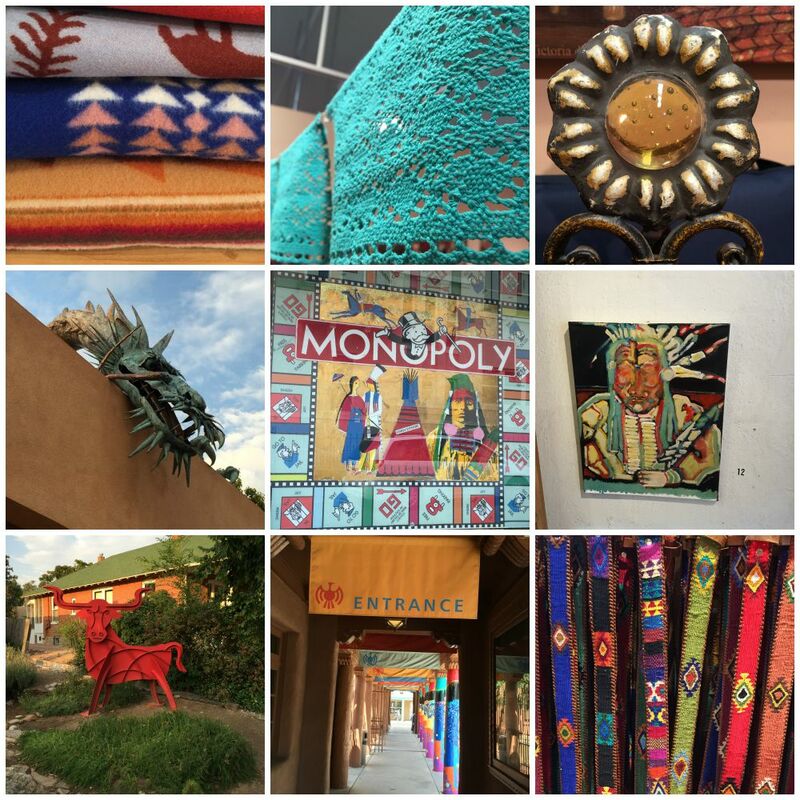 When we drove back through from Colorado Springs to Albuquerque, we stopped to do some light shopping, visit Cheesemongers of Sante Fe and have dinner at Casa Chimayo Restaurante. 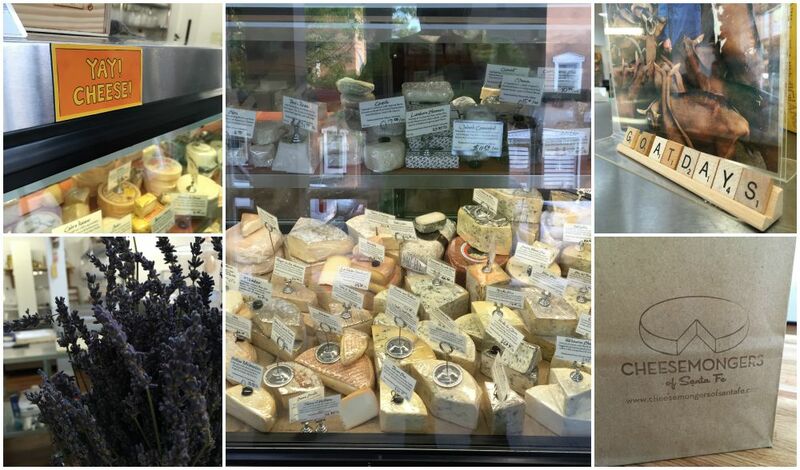 Cheesemongers had a great selection of cheese, cured meats, jams, and various pickled produce. While we waited (which wasn’t long) we got free samples…lots of free cheese samples. We ended up with Adelegger, a cheese from the German Alps made from unpasteurized cow’s milk that was aged 14 months. It’s what cheese-people think of as a classic mountain cheese, though German cheese is still new to me. It is firm textured cheese that is “washed” regularly with white wine and herbs so it has an aromatic edge and a sweet body. Our second cheese was an unpasteurized cow’s milk from Southern Holland called Wilde Weide. Similar to its more famous cousin gouda, this cheese has speckles of amino acid crystals and can taste nutty and buttery, but also has warm aromas of whiskey or bourbon. So we packed our cheese and meats to enjoy on our journey. 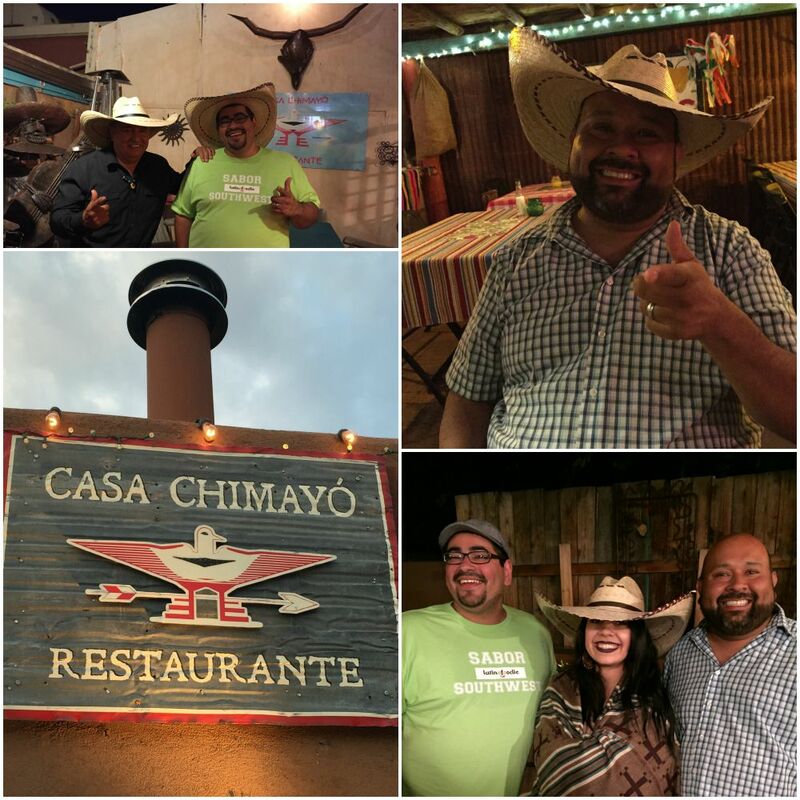 Dinner was a kitschy Mexican restaurant called Casa Chimayo Restaurante, which proudly serves the food of “New Spain” and the settlers and families who helped colonize the area, the owner told us proudly. It reminded me of an adobe hacienda, with a beautiful brick-lined path that opened up to a festive courtyard. Most of the diners were eating outdoors, so we followed suit. Besides, it was a gorgeous night. We planned to order a small bowl of red pozole to share because we kept hearing about “the” pozole of New Mexico. This pozole was full of hominy and chunks of tender pork, drowning in a thick, but not sticky, red chile sauce. After deciding it was too good to pass up, I ordered a second bowl. I will admit that I was disappointed with the homemade flour tortillas. They just were not pliable and turned hard once they cooled. But the pozole was everything! My favorite part of dinner at Casa Chimayo Restaurante (besides the red pozole) was when the owner casually walked over, after making rounds to his other guests, and started telling us the history of his restaurant, people, and food. He spoke with such passion that it filled the air with a spark. Before he left I asked for a picture, but he said he would only comply if I agreed to put on one of his hats from Guadalajara. Would I?! In all, the friendly hotel clerks, artisans, cheesemongers, the traditional cook and the modern one, made my brief visit to this town a surprisingly pleasant one. 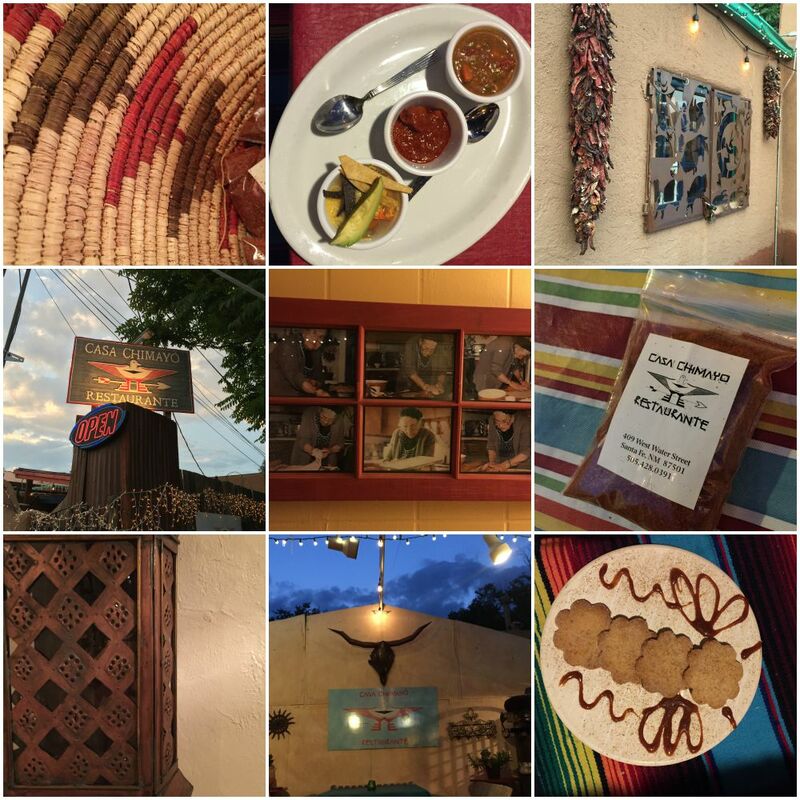 We were a bit early so I didn’t see the chile roasters, which was disappointing, but we got to taste a big piece of southwestern cuisine amongst the adobes of Santa Fe. A big THANKS to Toyota for sponsoring our #SaborSW tour with a shiny new 2015 Camry XLT, that we named Chula. And THANKS to the folks at Best Western for accommodating us in Santa Fe. If you’re ever in town, you’re gonna love their indoor pool and leather bed skirts! In case you missed it, read about our stay in Sedona, AZ. Follow us to see where Chula the Camry takes us to next! Love New Mexico green chile. Stephen’s Tafoya ancestors went to New Mexico (now Truth or Consequences) before coming to Southern California, and the step-grandfather who died before Stephen was born, Herb Dioses, was a manito from Las Cruces/Old Mesilla. I understand your disappointment with the New Mexico flour tortillas. Herb did not help my popularity with his grandnieces when after a week of their tortillas, he told me to show them how Californio tortillas (sonorensillas) were made. I’m on a committee to recommend design for a new baptismal font for my 120 year old parish church. Going to check out that central baptismal font at the Basilica for ideas. Glad my boys are back home. Will be in So Cal from 09/10 to 21. Hope to see you. 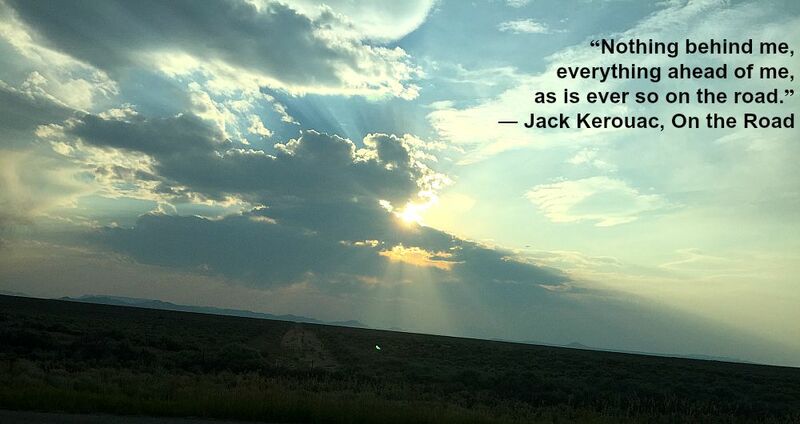 We love hearing the stories of our family, especially ones that take us back generations. My dad was sharing with us about his mom’s parents, my great grand parents moved into Clifton, Arizona back in the late 1800s to seek work in the mines. They came up from Juarez, Mexico. I knew there was a reason why I loved Juan Gabriel so much!! 🙂 We love you Aunt Penny and hope to see you when you are in town.